Last edited by Mad Pierrot; 2018-01-18 at 14:17. Has issue 227 been out before, because I see it up on my new site just now as an update and I'm not sure after the last time I saw an old manga updated was them being years too slow. Haven't found the chapter but the title is "Saying Goodbye to A.W. - Secrets and Remains"
In a way, it's a good sign, that means Hoshino isn't planning to rush the story and intends to finish it properly. Such a shame about her health. We saw Crowley in this chapter. How many years had it been since his last appearance? Last edited by Mad Pierrot; 2018-03-01 at 14:04. Yeah that one was obvious seeing Allen's compassionate nature is impartial. 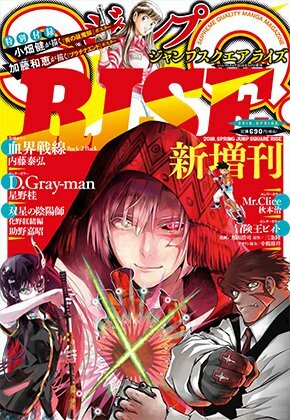 Looks like the manga will be serialized in the new Jump SQ Rise magazine starting on April. I never realised how much I loved Tim until... you know. So, I think Hoshino also confirmed that Cross Marian is dead. This is the second time she revises the how he was attacked by the cardinal. Wonder what she will do with Allen considering how he has been losing friends a lot and has not even seen the Earl's true face. I'm having trouble finding English translations. I've heard great things about it but I would need a translated version to get into it. Did Apo just ate Cross after shooting him? Well I'll be damned, that was a proper chapter !! Yeah, I was surprised by the length. Sadly, not much happened. Hum... Chaozii wouldn't agree on this, seeing his creepy look over his shoulder. I'm guessing he's fully aware that Allen's friends aren't really on board with that whole capture thing. He clearly is. I'm also speculating he will be the example of what happen when you meet Apocryphos without a memory wipe, a.k.a crazy-mode-exorcist. He rejected Allen for being a Noah but I will question Innocence all the same. Will it be a redeem arc to make him buddy-buddy again with Allen or a tragic one because "once a Fallen, always a Fallen so just die, angry character...". Kanda and Lenalee having a crystal type Innocence may save them from "doubting" their innocence and falling into despair. So next chapter might be the fight against Apocryphos? Still, I have no idea how could they defeat that guy with only Innocence.